Clean up your Windows Desktop FAST! When I'm working on my computer I like to open up a LOT of windows at the same time. With so many windows open, if I need to go to the desktop to open a new program, there's a lot of clutter in the way. 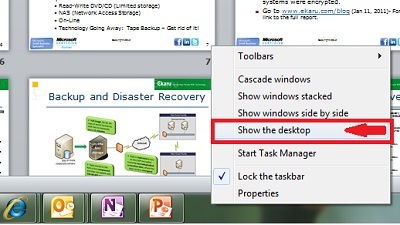 Quick Tip: A very fast short cut to get back to the desktop is to right-click on the taskbar at the bottom of the screen, and select "Show the desktop". This will get you to a blank desktop without having to close the windows one by one.